Here's the latest counterfeit label, an emailed inquiry regarding a Munich-like instrument for sale. 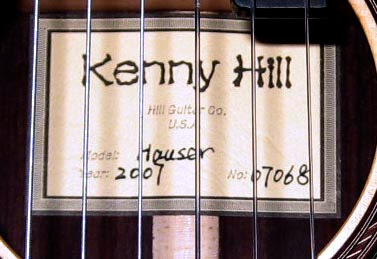 Among the red flags here - the label isn't any of our labels, it has the appearance of the Hill Guitar label, but the serial number makes no sense, the model doesn't exist and, well, the KENNY HILL type font is hysterical. Further, this label is attached to a Munich-like instrument, which would carry a New World label. 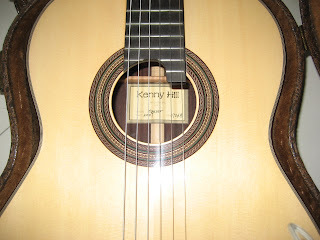 The most disturbing thing about this label is the suggestion the guitar was made in the US, by us, which is not true. We encourage you to know your seller, and check with us to validate the authenticity of a guitar in question.